A few Easter one-liners for evey one today. He said it was eggs-cellent! What did the rabbit say to the carrot before he left? It’s been nice gnawing you! How does a rabbit keep his fur looking good? 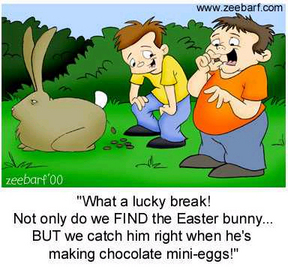 What would you get if you crossed the Easter Bunny with an overstressed person? Posted on April 8, 2012 by Joker in Clean Jokes and tagged Basket, Bunny, Chicken, Easter, Eggs, Holiday, Holiday Jokes, Kid Jokes, One Liner by Joker. Bookmark the permalink.